Ryan Zimmerman | Let Teddy Win! Video: Jefferson leads the way in Nationals Independence Day tradition. Longtime Washington Nationals fans know two universal truths about Independence Day at Nationals Park. Ryan Zimmerman will have a big day, and Thomas Jefferson will win the presidents race. Zimmerman delivered with a homer and three RBI, making him 10 for 20 with 13 RBIs in six Independence Day games. And for the third year in a row, founding father Thomas Jefferson, scribe of the Declaration of Independence, led the 4th inning presidents race wire to wire, carrying an American Flag all the way. Ryan Zimmerman needed little help making his case for the All-Star team on Tuesday, belting a double and two home runs, including a walk-off game-winner to lead off the 9th inning. But in fact the best third baseman in the National League did not draw the fan votes he needed for an automatic berth, and while he was honored to be named to the “Final Vote” ballot by National League managers, he still needs fan support to be named as the final member of the roster. So after Abraham Lincoln narrowly edged Thomas Jefferson to take Tuesday’s presidents race victory, the Nats’ racing presidents made a plea of their own, holding up signs that said “Send Zimm to Anaheim.” Even the Gecko joined in. VOTE HERE. The Nationals kicked off a ten game homestand Thursday night with a terrific outing by Livan Hernandez and a walk-off game winning RBI by Ryan Zimmerman to take the first of four from the New York Mets. 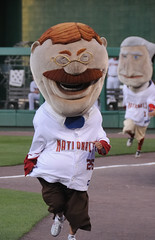 As the Nats returned to their winning ways at home, Teddy Roosevelt returned to his losing ways as well, putting up no fight whatsoever asThomas Jefferson narrowly beat our George and Abe for the presidents race victory. For next week’s series against the Padres, the Nationals have released a 1/3-off coupon code “for Teddy’s friends”: Order at Nationals.com using Coupon Code “TEDDY” (all caps) and get half-price tickets in select seating sections for the 3-game series vs. the red hot San Diego Padres starting Tuesday at Nationals Park. The coupon is valid for online orders only, and gets you discount tickets in the outfield corners ($23), the outfield mezzanine ($20), or the upper infield gallery ($12). DC Metro commuters got a surprise welcome as Teddy Roosevelt and his racing president cohorts greeted passengers with Nationals ticket coupons at the Metro Center exits Monday. The racing presidents were promoting the homestand that starts with a Free T-Shirt Tuesday against the Atlanta Braves at Nationals Park and continues with a Mothers Day weekend series against the Florida Marlins. You couldn’t ask for a better weather forecast, and despite losses Saturday and Sunday, the team arrives in town with a winning record and just 1.5 games out of first place in the NL East. For the upcoming series, the Nationals have again released a half-price coupon code “for Teddy’s friends”: Order at Nationals.com using Coupon Code “TEDDY” (all caps) and get half-price tickets in select seating sections for the 3-game series vs. the Braves starting tonight at Nationals Park. The coupon is valid for online orders only, and gets you half price in the outfield corners ($18), the outfield mezzanine ($15), or the upper infield gallery ($9). On the opening day of the Masters golf tournament, George Washington and the Nationals’ racing presidents decided to pay tribute with a little 4-man golf scramble during the 4th-inning presidents race this afternoon at Nationals Park. Emerging from the centerfield starting gate with golf ball and club in hand, George went first, hitting the ball down the outfield warning track, then handing the club to Teddy for the second shot. With the other presidents concentrating on golf, George seized the opportunity to bolt for the finish line, and won the race uncontested. The Nationals’ victory today over the Phillies was not quite as easy but even more sweet. Ryan Zimmerman’s late-inning RBI double enabled the team to head to New York with a first victory under the belt. After disastrous starts the previous two Aprils, the embarrassing outpouring of Phillies fans for Monday’s opener, and poor pitching performances in the first two games, the Nats had a major PR problem brewing; but victory cures all ills. As they hit the road, the Nats are just a game under .500, and Teddy is just one win behind the presidents race lead.